Modern robots can perform all kinds of dangerous and difficult tasks, from defusing bombs to manufacturing cars. Yet while these superhuman machines excel at specific tasks, they can't do a list of general chores or learn additional skills on their own. But a new super-dexterous robot hand can "learn" how to perfect new abilities over time -- without any help from its three human overlords at the University of Washington. The trio of researchers presented their handiwork, called the Adroit manipulation system, on Tuesday at the International Conference on Robotics and Automation in Stockholm. The Adroit system gets the world one step closer to the Jetsons' housekeeper robot Rosie: hardware that performs better than human bodies, yet is controlled by a software "brain" that learns like a human mind. The researchers say their creation has potentially huge implications for the robotics field, and for any industry that requires a variety of complex tasks -- from space exploration to healthcare to automated butlers. Manipulating robot hands to perform fine-motor tasks like catching a stick, rotating a tube or rolling a block "is one of the biggest problems in robotics," lead researcher Vikash Kumar told CNNMoney. "Building a generalist is far more complex than a single-task robot." So in their work at UW's Movement Control Lab in Seattle, Kumar and his team focused on building a robot that could perform general tasks and adapt to its environment. In a YouTube video Kumar posted, the robot hand figures out how to rotate a tube of coffee beans by moving its fingers just so after a series of trials and errors. At first, the robot manages to move the tube only slightly. On the next try the hand pushes up its first and middle fingers a bit more, and it manages to rotate the tube further. The hand continues to tweak its movements in subsequent attempts and finally completes the rotation without human intervention. Kumar and co-researcher Emanuel "Emo" Todorov started by building the hardware. They spent two-and-a-half years working on a custom five-fingered robot hand that is one of the most advanced in the world, with fingers that boast superhuman speed and reach. Enter UW computer science professor Sergey Levine, who built machine-learning algorithms that use data from past attempts in order to improve -- without additional programming from researchers. "When [the robot hand] fails, it takes that data and thinks about it and figures out how it needs to change in order to perfect the task," Kumar said. "It tries again and does a little better and thinks, 'OK, I'm improving, but I've failed again. Let me try to move that finger a little more next time.'" That process continues until the robot has mastered the task. "The things that are difficult to us -- multiplying numbers or playing chess -- are not so difficult for machines," Levine said. "But our brains are beautifully designed for controlling our bodies, which is hard for machines to do." 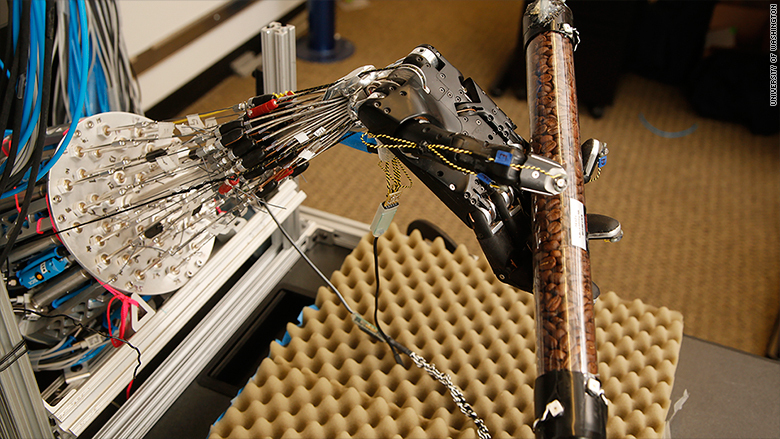 Additionally, even though contact from a foreign object is typically difficult for robots to handle, the hand was able to deal with interference like a human touching one of its fingers or air blown through a tube. "It's a big positive for learning, because the algorithms are general," Levine said. "You don't need to spend years writing new software or a building a new robot, which has obvious economic implications across industries." Kumar said the building of this initial Adroit system "was experimentation, not cost savings." The project cost about $300,000, which included customizing parts of an existing robot called the Shadow Dexterous Hand. They ended up with a hand that features 235 sensors, pneumatic tendons and a slew of external cameras. But the system need not cost that much, the researchers said. The UW trio said they imagine future applications in any industry that requires dexterous tasks: marine, space and warfare exploration; delivery of medication to the elderly and infirm; defusing of bombs; or merely slinging that tube of coffee beans at a café. But all three researchers said they are most excited about the prospect of a sort of robot butler: a generalist machine capable of performing various chores and adding to its repertoire over time. "If you get a robot to make toast, that's a toaster -- an appliance," Todorov said. "We want a lot of capability in one machine." To do that, Kumar said, consumer-friendly robots will need sophisticated safety measures and "a long-term understanding of how the present moment and environment affects their ability to do future tasks." But "we are far from that," he added, cautioning against imagining a chore-less world full of robotic Alfreds and Jeeveses within the next few years. "People get excited, and they fail to convey properly how far we are from that future," Kumar said. "It's a step forward in what will be a long process. But it is an exciting step."